Adair Payne is native of Northern California, growing up in the community of Lincoln against the Sierra Nevada foothills. He began painting the local countryside at an early age, being commissioned by local collectors and land-owners. While his creative direction wasn’t mainstream in the time and place of his youth, he was compelled to speak for the land, calling attention to the natural world around him. In 1984 Payne received his BFA from Brigham Young University, specializing in graphic design. After college he relocated to the East Coast, accepting a position with a design firm there. After six years, and missing the wide open spaces of the West, he came back home. Still longing for brush in hand, he then gradually transitioned into a career in commercial illustration, specializing in colorful and lavishly-illustrated story maps for corporate clients as well as the tourism industry. A short list of his favorite clients includes Crystal Cruises, Visa, Intel, Honda, Chrysler, Delta Airlines, Lucent Technologies, and Motorola. In more recent years, Payne’s artistic pursuits have come full-circle back to his roots, now focusing his creative energy primarily on his native landscape. His objective is to record the visual impressions of a rich, unique, and gentle land that has become increasingly developed and exploited. 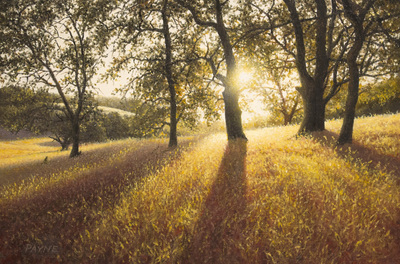 The artist’s philosophy is fairly straight-forward, motivated by a deep connection to the land that nourished his spirit and body from the beginning, returning something of appreciation which he hopes inspires others who contemplate the Northern California landscape. Consistently Payne’s finished art has a pervasive sense of tranquility, reverence for the natural world, and often an element of solitude and retreat. Payne is fairly obsessive about the emotional effects of light on the landscape. Typically, very early morning light and very late sunlight are his preference, though he’s also fascinated with the moodiness of fog and California’s seasonally thick, humid atmosphere. While he is essentially self-taught as a painter, his approach to painting has evolved over a lifetime, influenced and informed by years as a graphic designer and illustrator. A viewer may first notice the artist’s attention to detail. However, the overall design, the visual energy of the composition, and its emotional impact are his key concerns as he begins work. He is equally versatile in watercolor and acrylic, but his large landscape work is always executed in oil since it provides the ideal working properties for his preferred subject matter and style.